My coach of the year for 2017 regardless of division is Ursuline Academy's Rachel Bea who has been building a program since she took on the cross country head coaching duty in 2013. By 2015 she started winning the league (GGCL) every year and has now won three straight (2015, 2016, 2017). At the VOA district meet her team went from 4th in 2015 to winning in both 2016 and 2017. At the regional meet the Lions went from 8th to 3rd to 2nd, and at state from not qualifying in 2015 to 10th in 2016 to the podium in 2017 with a state runner-up performance. It was the first appearance for Urusline on the podium in school history. The long journey was now complete and Rachel Bea is now the Queen of distance running in Cincinnati both as a runner herself and now as a coach. 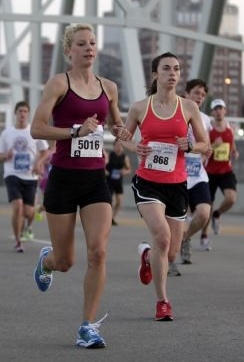 In the photo above, she is shown running the Flying Pig Marathon in 2012 which she went on to win, the year before she was hired to lead the Lions to glory.